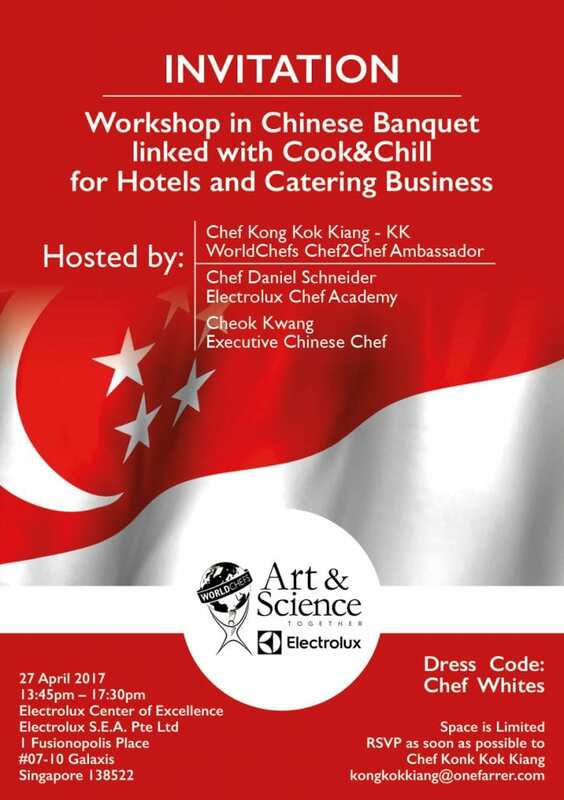 Art & Science Seminar as part of the partnership between Electrolux & WorldChefs took place in the Center of Excellence, Singapore on 27th April 2017 gathering Senior Chefs and industry experts aiming at delivering different preparation and regeneration techniques linked to Cook & Chill system for Chinese Banqueting. The chefs in attendance got to learn more about how technology could assist in running and managing different types of Kitchens profitably, improving Food Cost and better managing Waste. Hosted by: Chef KK, Worldchefs’ Chef2Chef ambassador and Daniel Schneider, Electrolux Chef Academy in Singapore. The aim of the workshop is to build on, and extend the range of skills, techniques and knowledge on hotel and catering operations previously acquired. This session aims to build on current technical practices and create new culinary knowledge, skills, and techniques using cook&chill and proper regeneration in different ways to enhance the food item and the menu.